Paper Template is usually $15. This set of standard sized pegs is ideal for our Pursuit Cribbage boards. 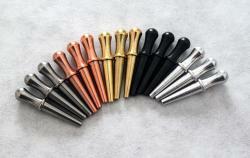 It contains 15 pegs, 3 each of Copper, Brass, Stainless Steel, Aluminum and Black Steel. These standard metal pegs suit boards with 1/8" holes. 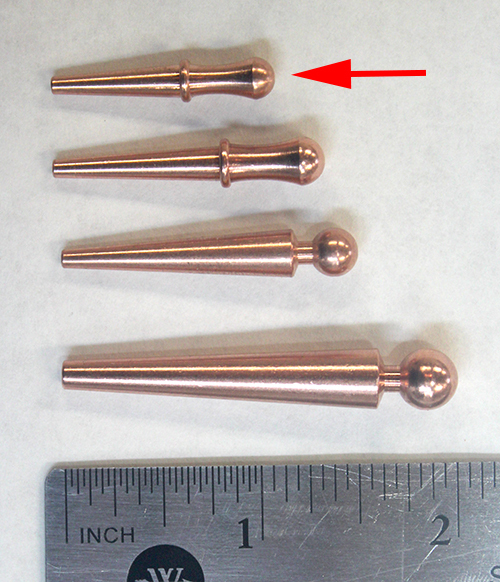 They measure 1 1/8" long with a 7/32" head and are tapered to fit 1/8" holes. If you choose to add a Pursuit Cribbage Paper Template, it'll add $10, saving $5 overall. Each order of pegs shipped within the US will also include a free deck of new Bicycle Playing Cards! Please note that orders that contain only pegs and paper templates usually ship via First Class Mail, including those going to Canada. Canadian orders for large quantities may be split into multiple packages to keep under the limits for First Class International. Although we don't manufacture these pegs ourselves, they are made here in the USA!